My mother is obsessed with Japanese desserts. Green tea (matcha) ice cream. Daifuku. Taiyaki. Yokan. Aduzki bean anything (that goes for any Asian desserts, really), and so on, she’ll love to get her hands on and savor them. She adores Japanese desserts because of its great balance of sugar (most of their desserts aren’t sweet, if you had) and the textures are sublime. Over the weekend, my mother and I were talking over the phone and she requested me to bring dessert over for the Dragon Boat Festival dinner (I’ll write a post about that soon) we’ll be having. After some thinking, why not try to make the Japanese soufflé cheesecake she’s been hankering for years? Keep in mind, American style cheesecakes are very rich, heavy and decadent that a small slice feels like a meal in itself. Japanese soufflé cheesecake has the velvety texture of the former cheesecake but it’s so much lighter due to less cream cheese and the use of meringue to lighten the cake. The cake flour adds some structure to hold up the meringue. 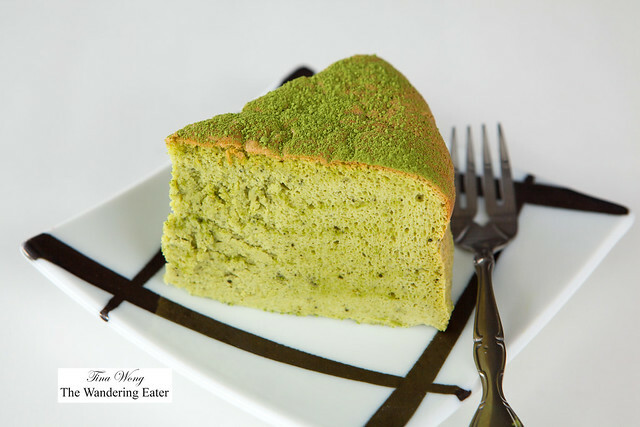 I prefer to stick with cake flour since it’s gluten content is a lot lower than all-purpose and wouldn’t change the cake’s texture. I know the recipe is by weight and in baking, precision is key. 1. Preheat the oven to 325°F. Set up a water bath by having a large roasting pan or any pan that could fit your springform pan and is about 2 to 3 inches deep. Boil about 3 cups of water and let it cool and set aside. Prepare the springform pan by wrapping the pan with a large sheet (or two) of aluminum foil externally. Grease the inside of the pan with butter or non-stick cooking spray and line it with parchment paper on the bottom of the pan, and up the sides with an inch above the edge of the pan. Coat it with another layer of grease to prevent the cake from sticking. 2. Place the butter, cream cheese and milk in a medium-sized saucepan and melt it in medium-high heat. Stirring occasionally with a whisk so it blends uniformly. Make sure you do not boil the mixture. Once it’s a homogenous mixture, turn off the fire and set the pan aside to cool. When the mixture feels cool enough that when you stick your (clean) pinky finger and it does not burn, add the egg yolks and whisk until blended. 3. 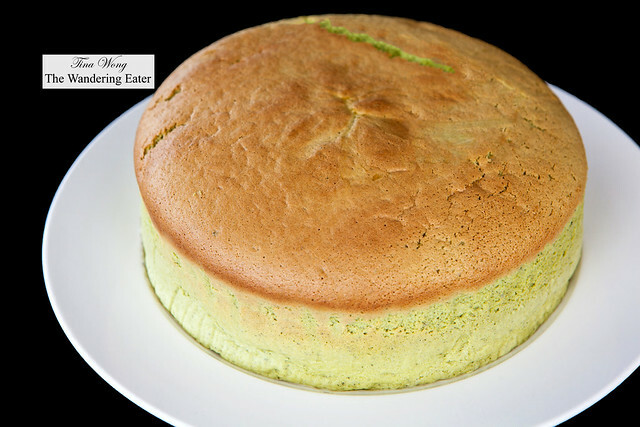 In a large mixing bowl, whisk or sift the cake flour, cornstarch, matcha tea, and salt until it’s blended, set aside. Add the cream cheese mixture into the flour mixture and carefully fold with a spatula until it is combined. When all of the sugar is added, turn up the speed, one by one, with 30 to 45 second intervals up to speed #8 and let the mixer running until you see the egg whites are opaque white and voluminous. The way to know it’s ready is to turn off the mixer, remove the whip attachment and see if the egg white stands up as a peak (with a tiny bit of a curl on the end) when you invert it. 5. Using a rubber spatula, about one-third of the egg white mixture to the cream cheese mixture and whisk until combined. Add the remaining egg whites to the cream cheese mixture and gently fold with a rubber spatula until there are no streaks left. 6. Pour the cake batter into the prepared springform pan. Set the pan in the water bath and let it bake for about 1 hour and 15 minutes until set and golden brown and a cake tester comes out clean (a few crumbs is fine, as long as the tester is dry). Cool the cake for 15 minutes on a wire rack, then remove the sides of the pan. The cake will start to shrink if left in the pan. Carefully remove strips of parchment paper. Let cake cool to room temperature, then refrigerate at least 3 hours before serving, preferably overnight.